We are here at the Uffizi, for the presentation of the restoration of three of the gallery’s most ancient works. The three works are all paintings on wood – two crucifixes from the 1200s and a diptych from the 1300s. While the exact date of their creation and the artists responsible for the two crucifixes are unknown. Experts believe that the first Crucifix was made by a Tuscan painter in the mid 1200s, though it’s provenance is still unknown. It has been in the Uffizi collection since the 1881. The author of the second crucifix is also believed to have been an artist working in Tuscany. This crucifix made by the so-called Maestro della Croce 434, was likely made between 1230 and 1250. This crucifix is mentioned in galelry documents for the first time in 1888. This work is characterized by its luminosity and linear style. However, experts have attributed the diptych – which depicts the Madonna with Child and Saints and a Crucifix – to famous artist from the Lucca School, Bonaventura Berlinghieri. The work entered the Uffizi collection in 1948 and it is believed to come from a convent in Lucca. 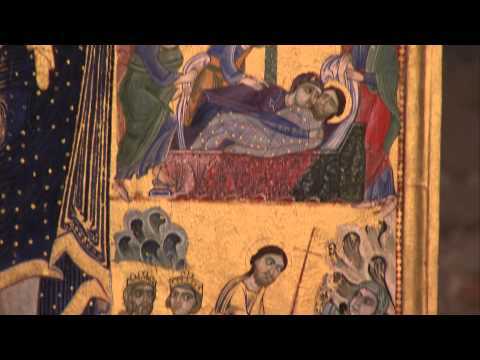 The three magnificent medieval artworks will be on display at the Uffizi – in the former-church of San Pier Scheraggio until March 29, 2013. entrance is free. After this, they will be moved inside the gallery, for permanent display in Room 2, which also features the Maestà by Giotto, Cimabue and Duccio da Boninsegna. The restoration of the works was funded by the Amici degli Uffizi Association, a nonprofit association founded in 1993 with the aim of protect and restore the Uffizi Gallery collection and promoting its initiatives and artworks.